Flyers bore the brunt of the Air India pilots' strike with some complaining that they were not informed about the status of their flights and some coming to know about the cancelled flights only after reaching the airport. 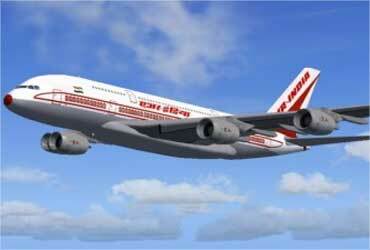 Air India cancelled 60 flights this morning leaving many flyers stranded. "Me and my family had to attend a marriage in Srinagar on Thursday and we had booked our tickets about a month ago, but now our plans are ruined as Air India has cancelled the flight and they don't have the courtesy to inform us before hand," said Mohammed Sahil Sheikh, a businessman. "We came to know about it only after we reached the airport, even their helpline could not give us correct information about the flight, this is how our national carrier works," he said angrily. At the AI counters, passengers were seen enquiring about their flights and collect printed copies of their tickets but many had to return empty handed. Many flyers had either postponed their travelling plans or cancelled their tickets. Some of the passengers were seen trying their luck at the counters of other airlines to get a seat in their flight. Image: Air India pilots on strike. "I had to reach Bangalore for a conference but my flight is cancelled and now they are showing their helplessness in accommodating me in other airlines, saying their seats are already full," complained K Krishna, a software professional. "I am trying hard to get a ticket on any other airline but everyone is refusing saying they have no seats vacant," he said. Demanding a fixed salary, removal of Air India CMD and a CBI enquiry into the alleged mismanagement, 800 pilots have gone on strike from Tuesday midnight. tide over the crisis, the national carrier has decided to rope in 150 management or executive pilots to operate the flights, the official said. On Wednesday, at least 40 Air India flights were cancelled on the first day of the strike by its pilots causing enormous hardship to thousands of travellers. 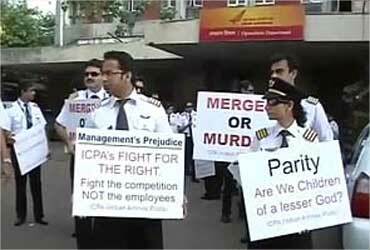 Demanding removal of Air India CMD and a CBI probe into the alleged mismanagement, 800-odd pilots belonging to the erstwhile Indian Airlines and owing allegiance to the Indian Commercial Pilots Association (ICPA) had gone on an indefinite strike from Tuesday midnight. Image: 800 pilots on strike. Taking a stern view of the stroke, Air India management sacked six ICPA leaders including President Capt A S Bhinder and General Secretary Capt Rishabh Kapur, derecognised the union and sealed their offices across the country. 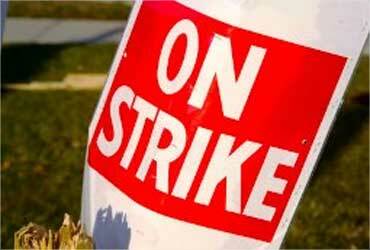 Also, the Delhi high court asked the agitating pilots to call off their strike in "larger public interest". The ICPA leaders said they may move Supreme Court on Thursday after completing the legal consultations.